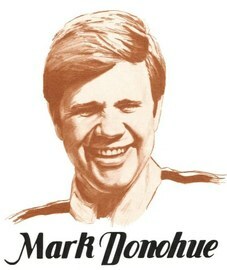 Mark Neary Donohue, Jr., nicknamed "Captain Nice", and later "Dark Monohue", was a race car driver known for his ability to set up his own race car as well as driving it to victories. Donohue is probably best known as the driver of the 1500+ bhp “Can-Am Killer” Porsche 917-30 and as the winner of the 1972 Indianapolis 500. Cars that Donohue raced include: AMC Javelin, AMC Matador, Eagle-Offy, Elva Courier, Ford GT-40 MK IV, Ferrari 250LM, Ferrari 512, Lola T70, Lola T330, Lotus 20, McLaren M16, Porsche 911, Porsche 917/10, Porsche 917/30, Shelby Cobra, and Shelby Mustang GT350R.